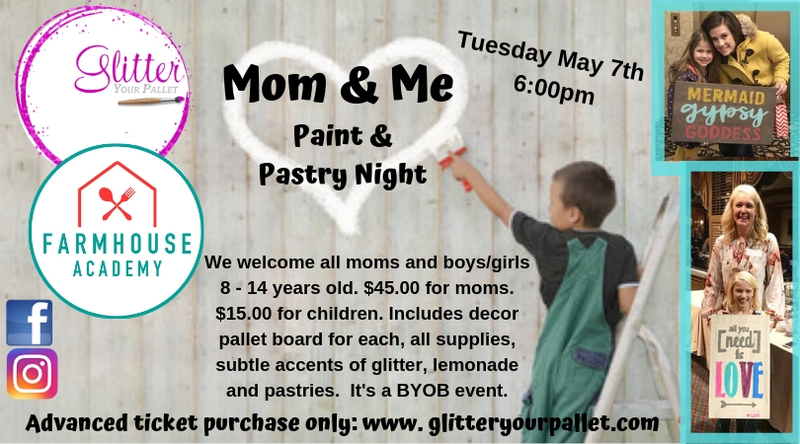 Farmhouse Academy welcomes Glitter Your Pallet for the “Mom & Me Paint & Pastry” event. Join us Tuesday May 7th @ 6:00pm. Pastries are included and will be served. Lemonade is included and will be served. This is a BYOB event. $45.00 per person includes pre-painted decor pallet board. Size is size 24″ x 14″ and all supplies, 30 design options, step by step guidance and subtle glitter accents. $15.00 per child includes 12″ x 12 pallet board, all supplies, step by step guidance and subtle glitter accents. ***Please note, the instructors will happily glitter the board for a professional look. Should your child want to express their creativity, one glitter kit will be offered. This is an either / or option that can be decided the night of the event. 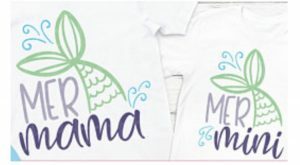 We will be offering a variety of design choices, separate for both moms and boys and girls. 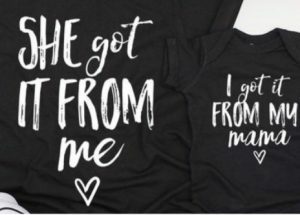 However if you’d like to make the night extra special be sure to reserve one of the “matching mom and me” designs at checkout. (no additional charge) See examples below. 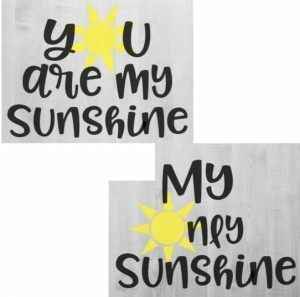 Mom: You are my sunshine. Child: My only sunshine. Mom: She got it from me. Child: I got it from my mama. MOM: Mer mama. Child: Mer mini. 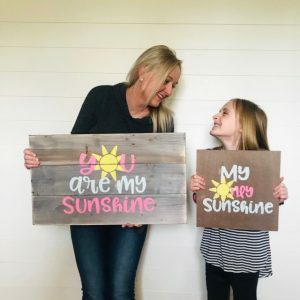 10 available	 Mom & Me ticket $60.00 $60.00 ticket includes: One - 24"x 14" decor pallet board for mom, all supplies and subtle accents of glitter. One - 12"x 12" board for child, all supplies and subtle accents of glitter. 4 available	 Additional child ticket $15.00 $15.00 ticket includes: One - 12" x 12" board for child, all supplies and subtle accents of glitter. ***Please note all children must be accompanied by an adult.